Another dayâ€¦ another Cadbury chocolate bar thatâ€™s not available in the United States. But hey â€“ our American reviewers regularly get to taunt me with offerings from the likes of Seeâ€™s and Trader Joeâ€™s, so fairâ€™s fair, right? Itâ€™s not a bad idea for a name since, as everyone knows from that guy on TV and his miracle washcloths, the Germans always make good stuff â€“ and that includes chocolate. 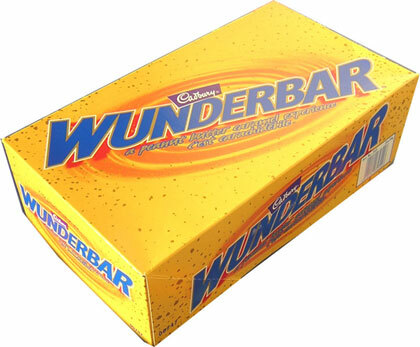 However, the Wunderbar is made right here in Canada, making it, in reality, about as German as a Snickers. That little Viking helmet on my bar’s wrapper isnâ€™t helping my confusion any â€“ Vikings werenâ€™t German, were they? Did Vikings like peanut butter? Who knows? The Wunderbar consists of layers of peanut butter, caramel and what tastes like that crunchy stuff in Butterfinger bars (anybody know if thereâ€™s a proper name for that stuff? ), and it isnâ€™t a bar I really go out of my way to buy â€“ if they didnâ€™t come in the same fun-sized Halloween assortment as Crunchie and Caramilk, I doubt Iâ€™d even know what one tastes like. When I open the wrapper, the bar smells like a Reeseâ€™s cup (a promising start). The peanut butter is smoother, richer and less salty than Reeseâ€™s, and itâ€™s studded with larger chunks of peanut. The caramel is dense and chewy. The crunchy layer at the bottom of the bar is very thin, too thin to be detected with the naked eye, but youâ€™ll know itâ€™s there. When you bite into a Wunderbar, your bottom teeth encounter a definite crunch as they pass into the soft peanut butter layer, at the same time as your top teeth are passing through the dense, rich caramel at the top of the bar. Itâ€™s an intriguing blend of crisp, creamy, crunchy and chewy (isnâ€™t that like the candy version of â€œhot, sour, salty, sweetâ€ for Asian food? ), and itâ€™s addictive stuff. Iâ€™m usually a candy saver and I really didnâ€™t intend to eat the whole (300 calorie) bar in one sitting, but it was gone before I knew it. Though really, for your calorie buck, youâ€™re practically getting three different chocolate bars in one â€“ a Reeseâ€™s, a Caramilk and a Butterfinger. More candy flavors for your taste buds to loot and pillage? German or not, Iâ€™m sure the Vikings would have approved. OMG….all this just seems Vun-derbar!!! i have to try it…do you know if i can get them shipped??? Hmm, the phrase “a peanut butter caramel experience” sounds really good, but I’m not sure how I feel about the dense, chewy caramel. I hate struggling to chew my candy, you know? That Butterfinger-like layer…does it get stuck in your teeth like a real Butterfinger? These sound awesome. Maybe we could start some sort of candy exchange program where you send us stuff from Canada and we’ll send you Sees and Trader Joe. BTW… the crunchy inner part of a Butterfinger is a peanut butter that is blended with sugar candy that is later kneaded, rolled, and cut. Nit-pick: “VOON-dare-bar” in many quarters. Cindy – the caramel’s not really that dense – as caramels go, I’d say it’s about medium. There’s not much of the peanut butter crunch, just enough to give you that initial crispness. Robby – I bow to your superior candy knowledge! I wouldn’t be adverse to a little candy exchanging, provided Canada Post didn’t rake me over the coals with the shipping. teqjack -darn it all, it’s been awhile since I took German in high school – I figured the lack of an umlaut meant you said it with that “cross-between un/on” sound (like “book”). I don’t know why… but I am craving Falco after reading this….